djkardkreations: NBUS Challenge #4! Here We Go! NBUS Challenge #4! Here We Go! For those of you who have joined recently, NBUS stands for "never-before-used schtuff." I found I was purchasing product at a faster rate than I was using it, so every time I used something new, I called it NBUS and I told you about it. That, and the fact that you also embraced using the acronym, encouraged us all to shop our stashes and use our schtuff! Rather than traditional blog candy, I wanted a way to thank you all for joining as followers and being so supportive with your encouraging comments, so I started a challenge and began to give you prizes for using your NBUS! Yup. It's my little way to help you turn your NBUS into ABUS (already-used-schtuff!)! And it's also my way to thank you! Look, I even made you a thank you card! I'm entering it in the current Happy Little Stampers Sketch Challenge, the Just Us Girls challenge, the CASology challenge, and the TIME OUT Challenge. Of course, it's made with a NBUS stamp. The manufacturer is Crafty Individuals (CI-385). The embossed die is "Stitched Rectangles" from Lil' Inker Designs. Use your virginal NBUS on a new creation and tell us what it is. Yes, it can be brand-spanking-new schtuff or as old-as-the-hills schtuff. The theme is "Anything Goes." You can just play here or if you play in other Blogland challenges using your NBUS, you can also link here! Cut and paste the NBUS button above into your post. Include a link back to the challenge post. Please enter only four other challenges, in addition to this one, for a total of five. You may enter up to three times. I was going to limit it to one, but that sorta counters my urging you to use up that NBUS, huh? I may only comment on one, if I run out of time. Link up your creation using the InLinkz button at the bottom of this post in the usual way. If you need instructions on how to do any of the above or have any other questions, please email me at darnell dot knauss at gmail dot com. There are also tabs at the top of my home page for quick access to both the "Rules" and former "NBUS Challenges" galleries. If you haven't played before, please do check the Rules tab for further info on commenting and about how to link if you don't have a blog. Five (5) $25 gift cards from any US company of the winner's choice will be awarded. Because you are all my friends, I could never select one of you over another as a winner, so I will use Dr. Random and Mrs. Dot Org, Mr. Hammy Hamster, Mr. Mister, or Mr. Random Stranger off the street to pick the winners. Please note, this challenge will only run for ten (10) days. It will close at the end of the day (nearly midnight at 11:55 [23:55]) PST, March 31, 2015. I will announce the winners on Thursday, April 2, 2015. I hope you'll join in and link up! I can't wait to see what you make with your NBUS! Enjoy your day! No, seriously, enjoy. LITS! * Mwah!! I can't believe I'm first to join this fab challenge. Love your super card, it has a wonderful stamped image, and super clean design. Thank you for this really great challenge, and congrats on having such a lot of followers. Well deserved may I add. hey dear Darnell, thanks for starting again this challenge... I changed the Link to here at the sidebar on my blog.... hope that´s okay for you. YAY to another NBUS challenge! And another YAY for your pretty card, Darnell. Love the pop of colour combined with the black silhouetes and the lovely frame brings it all together. Congrats on so many new followers, Darnell!! I certainly have acquired more than my share of NBUS since the holidays. I keep adding to the basket and I must start playing with it all. Hope I can get at least one card in before the deadline. Thanks for the inspiration! Yahoo another chance to use up even more of my NBUS schuff. I love the card you did, if you have time can you tell me. Are all those flowers together as one stamp and you just left the red flower head blank or was this a collection of stamps. It looks just wonderful, love that dash of red. Loving the card. I'd never think to do different colours on a stamp. Such a stunning card to inspire us to enter your fabulous NBUS challenge! Lovely card! Great framing of the focal point by embossing that die! I've got lots of new NBUS - can't wait to play! How exciting, another NBUS challenge! I can't wait to play along! Your card is absolutely gorgeous, Darnell. Love those pretty floral with a single pop of color. Hugs!!! Congratulations on having so many followers. You shouldn't be surprised! You are such a wonderfully kind and generous blogger and funny to boot! What a great combination. Oh and add talented to boot. What a lovely card you've shared here. It is stamped so cleanly. Love the pop of pink, too. Have fun with the challenge! Hi Darnell! Wow, NBUS Challenge número cuatro! Cool you rock girl! And it ends on my b-day, too. Maybe I'll be able to join in this time. Happy hugs! Your card is gorgeous! I have that stamp set in my NBUS too, in fact I think I have more NBUS than I have US. Fabulous!! I've cut back a bit on buying of late... but there may be a little kit from SSS on its way! Count me in! Congratulations on another follower milestone Darnell, and thank you for another NBUS challenge. I have plenty of NBUS waiting to be used, so I hope to back in the next few days. I love the way you used the beautiful CI stamp on your card. Yay! I haven't been doing much stamping recently so I'm going to use this challenge as a little jump start. I love your card and the look of black and white with the surprise of color. And I will have to check out Lil' Inker for some stitched rectangle dies. Everyone is using them but I haven't been able to find any in stock anywhere. What a stunning card! Love that stamp and how you colored just one blossom in for a pop of color! Gorgeous! I love how you used the stitched rectangle as an embossed frame - so pretty! Thanks for your generosity of spirit and time in sponsoring another NBUS challenge! A fabulous card Darnell - I'll be joining you soon with a NBUS card. Time to get my rear in gear this weekend and do some creating. Sat at my desk the other day, but the mojo just wasn't there! Have a super weekend, Darnell! Good luck in your latest NBUS challenge. I held back a stamp set just for this challenge. ;) I love the card you made, Darnell, and the thanks goes to you for hosting and commenting. I will certainly rummage through my stash and find some NBUS! I really like the effect of the one colored flower, what a great image too! Congrats on reaching another milestone following, Dolly!! Yay! Looking forward to playing along with your new NBUS challenge. Congratulations Darnell! What a milestone. So looking forward to joining in again! I love this beautiful card you made. Gorgeous graphic flowers scene and that rose coloured high-lit bloom is fabulous! I think I see a winner for these challenges you have submitted to! Oh, how fun! You know I'll be playing! I still have tons of NBUS that I'm slowly getting through. I'll have to get my act together as 10 days will fly by quickly! Your card is beautiful - I like that stamp! OMGosh,Darnell, I totally love it!! So simply elegant!! Tell me please, which means "schtuff"
Adore your card. Great image and the pop of red is perfect. This is such a pretty image! I love the pop of pink.....just lovely! Thanks for joining us this week at Just Us Girls! I absolutely adore this card Darnell... It's got to be my very favourite! I hope I get time to join in! So much fun....so happy you are doing this again, will get me to pull out some NBUS, which is always so much fun. Your card is just so pretty...love your sweet bouquet of posies and that pink one is so sweet. See you tomorrow. Hi Darnell - thank you so much for the nice comment you left on my blog, and thanks for following me! Your card is fabulous! And yes, all the doxies (in fact, all the critters) pictured on my blog belong to my sister and her husband. We recently rescued a little chihuahua and I need to get pictures of him on there too. Thank you so much for taking the time to host this awesome challenge; I look forward to looking at the other crafter's creations and finding even more blogs to love! Take care! Popped by with my card. I named my flower brad as the NBUS but I think the silk flowers are NBUS as well...Pretty darn sure! I will try to make one mare before the closing date...Thanks for running this fun challenge again...it really is so much fun!!! Yay! A new NBUS challenge! Such a pretty card to inspire us, too. Let's see if I get get my NBUS in gear to play in the shortened time frame! Wonderful card, Darnell! I love the embossed frame and the great stamp. Happy to hear of another NBUS challenge, Lordy knows we ALL have LOADS of that LOL!! But what I'm really happy about is this BEAUTIFUL card!! Love the single pop of color and the embossed framing! Oh fun! I've been using my NBUS, but bet if I try I'll find some more around here--LOL! LOVE your card, Darnell--striking & beautiful! Yay! Another NBUS! Your card is so beautiful! I love B&W with po of colour! Wohoo ...another NBUS Challenge...so excited...but not sure abt the participation as I lost my mojo n couldn't create anything ...but will try for sure ....let's c who wins ...my excitation or my lost mojo ..lol....love your card dear Darnell ..its simply pretty !! Oh Darnell this is just simply beautiful and hope to play along this time withe your NBUS challenge ...Im always full of good intentions and then when I look I'm too late !!! Probably won't get to play along this time.....adore your card! I'm sure you'll be a busy bee visiting for this NBUS & congrats on all the followers you've gotten!!! You know what, I think this is my favourite card of yours so far....its stunning and I love the stamp and the design so much. Definitely 'pinned' and will look at it often for inspiration. Great.....another NBUS challenge Dippy.....are you sure we can only enter 3 times????? lol Adore your card with that gorgeous focal point of the pink flower - it certainly pops. oh glad that here again we meet with you. Your challenges are for me a joy and a unique mystery. I was afraid that after the last time you finish this great fun, so the more accept my thanks, that still organizing these great challenges. Hugs, I host with you on a regular basis and they are for me a meeting with friends over a cup of tea. What a wonderful lady you are Darnell, another fabulous opportunity to use some of my ever increasing NBUS! Love these challenges and thanks as always. 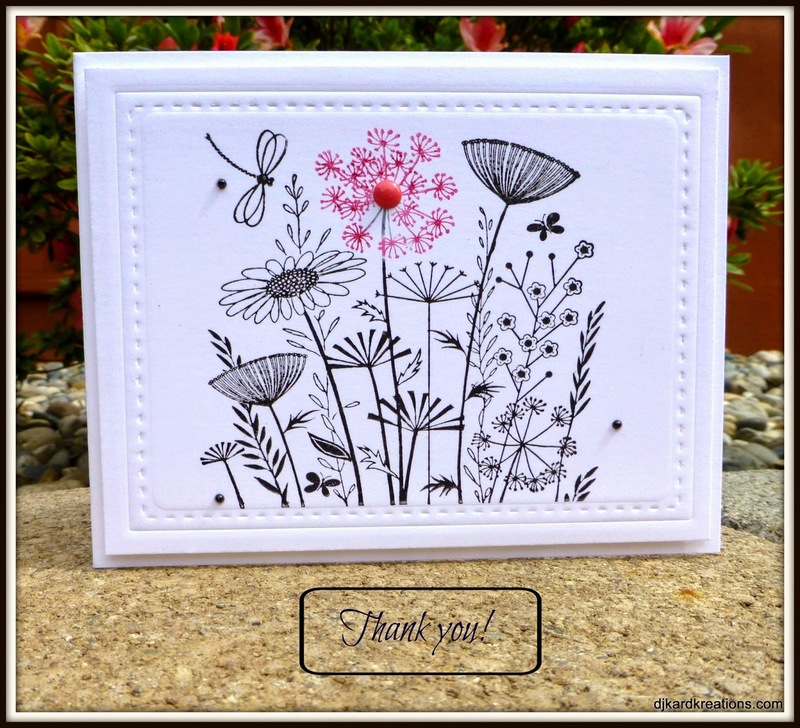 Love your pretty floral card, Darnell, the embossing is awesome! I also love playing in your challenges, and thanks again for last time...I used the gift certificate to buy the stamp and die set I used to make this card! Love your nubs image. It looks great with the one red flower I see your challenge is off to an amazing start! Gorgeous Darnell! Thanks for joining us at Just Us Girls...we so appreciate it! Woo Hoo!!! Great card there. Love that shot of pink. What a great challenge! I have lot of NBUS so surely could join in. What a lovely Thank You card youv'e made for all of us! PS Knee replacement to come in April/May and HI cruise postponed to November. Congrats on an even more amazing milestone!!!! Next week you'll be at 1000 followers! Gorgeous card, too! What a beautiful stamp you pulled out of your stash! See what I missed when I am one day behind? A fabulous CAS card--(that would be perfect for CASology, if you hurry--just sayin') and another NBUS challenge with 50 entries already. I've got a box of new stuff on it's way to me, so I will look forward to playing along. Hey Darnell! Your card is gorgeous. I want to case it. I hope to play along. I love this card Darnell! Really , really love it! My card is made just need to post it! This rocks, Darnell! I LOVE the pop of color from the flower and enamel dot! Thanks for playing along again with CASology this week! And whoop whoop to you on 811 followers! Your card is incredible Darnell, highlighting just one flower was genius! Looks like this challenge has taken off with a bang again, gotta say that you really are amazing! Oh, I like this! Darnell, what a great card!!! I LOVE the way you added a pop of color to the scene! Reminds me of one of those black and white photographs where only one small portion of the image is colored! What a great design! Your card is gorgeous! I love how you showcased the one flower with the pink, stunning! Thanks for playing with us at JUGS! I love how you've embossed the frame and added the one flower with the pop of color! What a classy card! My first time to enter your challenge, Darnell. I am very happy to use some of my NBUS items. Your card is just beautiful. I love that stamp. I love, love, love your card! The pop of color is just fabulous, and your CAS design is really pretty! Thank you so much for offering another NBUS challenge for us...you are so generous! Your card ROCKS Darnell! LOVE that stamped image and how you only colored one of them! Brilliant! Thanks for joining us at Just Us Girls! Ummm, hi Darnell, it's no. 104 here, I think, unless someone posts a comment ahead of me, then I'm even further down the line. Can I just say, love the card. It's a beauty, really! The stamp is one I've never seen, and you made it a class act on this card! If I ever get home, I'm joining in. Taking care of my daughter who had surgery. Mom duty. Looks like a fun one this month! Beautiful card Darnell and thank you to you as well for hosting this once again..and look at all the beautiful cards entered....you and Hammy will have your hands full for sure!! Super challenge again Darnell. I am so ashamed to have to say thy I have shedloads of NBUS in my stash. Do I need to go into therapy and sit in one of those semi circles of like minded souls and admit yes I'm a NBUS! Just in time for one more fun NBUS. It's good to see you and all the talent here. Love your card, those sketchy flowers are great... really simple and beautiful. Hey Darnell!-Beautiful card.I love the little splash of colour-it really makes the pretty image stand out. I have come to play in your NBUS challenge-but,i am only playing for fun so please don't include me in your draw this time-i need to use up my NBUS mountain!! Always fun to be able to use NBUS, thanks for the fun Darnell! I'm so happy to use my new SSS Woodland Frame. Love that you are still doing your NBUS Challenge and making us dig out our stuff that we just had to have! I came back for another play Darnell - crumbs, it's standing room only in here! Look at this fantastic turn out, so far! So happy that you decided to continue with the NBUS Challenges! You are awesome! Whew, realized as I was posting the Rudolph Day card, that it also qualified as a NBUS, so skated over for a fast linkup. Oh my do you ever have some fabulous entries, and I will get back over to peruse at a more leisurely time. Also in scrolling down to the challenge post, I got a glimpse of some breath-stopping cards you've shared. Gracious, life just gets too busy and I can't enjoy all the beauty I want to see! Big Hugs & Thanks for hostessing another NBUS Challenge. Mwah! I am new to your blog and this challenge! Glad to have found it. I dug out and used some old embellies and flowers for this! Thanks for the inspiration! WHAT A GRAT IDEA! luv the stamp set you used for your card, super cute! I will have to play along, I have so many new things...thanks! so glad you played along with us at Simon Says Stamp Wednesday Challenge! Thanks for alerting me to the fact I had forgotten to link my second card. Thanks for sponsoring this challenge...you know how I love to use up my Vos, NBUS and snippets!!! What a great card...love the one red flower. Thanks for another fun challenge. First off, I must admit, I've read every single post of your blog during the past, well, almost a year I think! And only now did I manage to start a blog myself and I have you and your amazing challenge to thank for that! Thanks for all your inspiration and keep the wordy posts coming! I really love how you did just one flower in that bright pink. It really pops. Such a dramatic effect. Thanks for host such a great challenge. I have way too much NBUS. I am so thrilled about the things you do and say that add to my world!! I must say it is a bit brighter because of you!! I hope you know what a delight you are!! With that said - I love your black and white card with the gorgeous pop of color!! The flowers are lovely and remind me of a meadow of wildflowers in the mountains where we used to go camping as a family!! Your card is most beautifully done! Have a truly blessed day!! Hooray! I have managed to get a card made with my new Stampin Up stamps in time to enter your super Challenge. Thanks Darnelle for all your blog posts, they always make me smile and often make me giggle. I am so glad you limit us to three cards because I could go on and on and on with new or new/old stuff. There are some amazing entries this time. So much fun! Thanks for doing this. And I loved loved loved your polka dot card this week. Whew, I had been meaning to enter your challenge for weeks but only now got some crafting time in. Love this motivation to break out something that I have never used (and unfortunately, I have a lot of that!). This sounds great fun - have I time to enter hmmm maybe not but hopefully next month. Only just seen the link on Chris's blog. Great idea. Wow, Darnell! I love how you used the stitched rectangle to emboss a frame. Looks fab, I'll have to remember to try that. Speaking of NBUS, I've been doing some buying lately, but not a lot of stamping. I should be doing this challenge!